Ascending a tree along a busy thoroughfare in Kitale, Rift Valley, Kenya. 7 Aptril 2011. 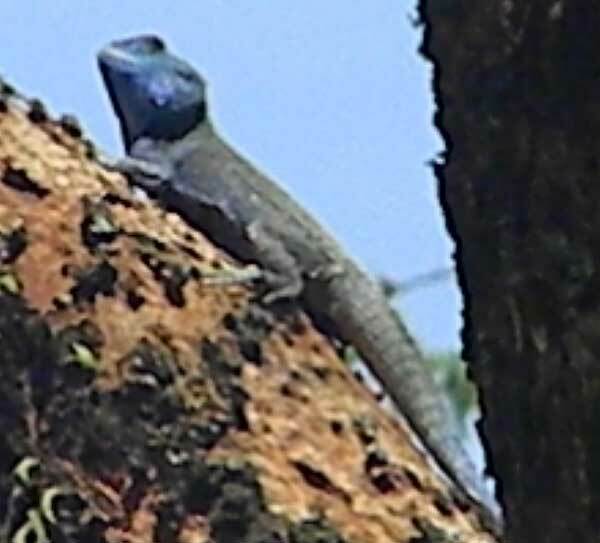 Male Tree Agamas appear larger than the females yet their length is not significantly greater than the females. By virtue of their head and shoulders being more robust and brightly colored they simply appear more intimidating from their arboreal habitat. Female Acanthocersus atricollis lack the blue coloration on the head and back; instead they are mottled brown in color blending in better on the tree bark. While hunting in trees these spiny lizards choose large numbers of ants for food (Reaney and Whiting, 2006). But because ants are small, larger arthropods (invertibrates with jointed legs and a tough exoskeleton) of many species form a larger portion of their diet. Crickets and grasshoppers are among the many other choices they make. Occasionally they will descend to the ground for prey but are quick to retreat back to the tree.